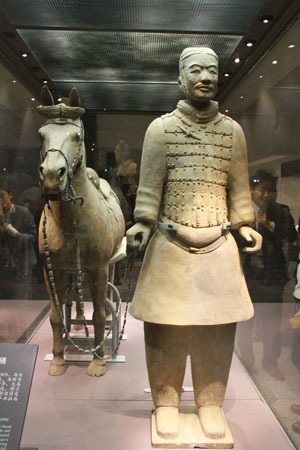 Qin&apos;s most famous historical site is the Terracotta Warriors. The Qin rulers conquered all the other states and some surrounding regions. However, their dynastic rule from 221-206 BC was the shortest in the region&apos;s history. Their empire fell apart after only 15 years. In only 9 years in successive wars from 230 to 221, the Qin conquered every other region of the former Zhou Empire. Then the Qin conquered outlying regions to the south all the way to Vietnam and to the north towards Korea. They had the biggest empire in the region&apos;s history until then. The society was very centralized to the point that every dissenter against the rule of the court was killed, tortured, or sent for forced labor, and most literature was destroyed. The people were enslaved for wars and great construction projects. The absolute power that the emperor and staff wanted for themselves corrupted them, and the dynasty quickly ended in assassinations and foolish policies and the people rebelled. The Qin were known for great construction projects. Major projects that strengthened the state were the Wei Canal that was completed in 246 BC and Dujiangyan that allowed irrigation of the Sichuan plain that was built in 256. See our Dujiangyan and Chengdu Tour. Perhaps it was this experience of success that led the Qin empire rulers to build even greater projects. They used the labor of millions of slaves to produce the Great Wall and the Qin Mausoleum that includes the Terracotta Warriors. The first Qin emperor called Qin Shi Huang exiled even his own son who would have been the prince to work on the Great Wall. It was said someone died for every foot of the wall that they built. The emperor wanted the high wall as a fortification to keep out northern tribes such as the Xiongnu. The Qin Mausoleum is a huge tomb complex that was constructed near present day Xi&apos;an. It was the mausoleum for the new emperor. It is said that most of it remains unexcavated and that only a small portion has been uncovered. The small part that has been uncovered called the Terracotta Army is astounding. 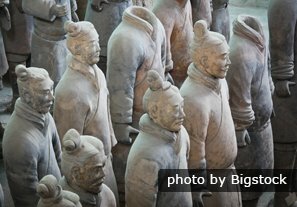 Two-Day Terracotta Warriors Tour is our Xi&apos;an best-seller. The Qin Empire is also known for its far-reaching policies. They standardized the writing system, money, and measurements and built a lot of infrastructure that helped the big region prosper later. Under Li Si, the writing system was standardized by ordering everyone to write in the script used in Qin. The rulers wanted everyone to be able to understand their orders and for the officials to communicate with each other. Officials were chosen based on their merit and their ability to obey the Emperor Qin Shihuang. But their projects and policies eventually destroyed the dynasty. The people revolted. By destroying the ideas and teachers who they were against, they established the dominant philosophies of their big region. There are written accounts about the ancient history of Qin, but it isn&apos;t known if the accounts are accurate. It is said that Fei Zi was appointed rule over the city of Qin in the northwest. 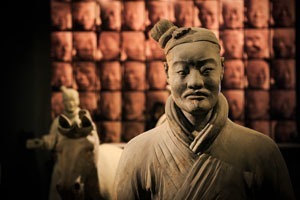 He is called the founder of the state of Qin. In 672, Qin rulers tried to expand eastward. The Qin initially didn&apos;t attempt conquests of other states because they feared that tribes around them would attack them if a large army left. Then Shang Yang came to power as a court official in 361. During the two decades that he ruled, he made big political changes that took hold. He espoused and ruled according to a defined set of strict rules and a clear political philosophy. He was eventually killed, but his philosophy that was called Legalism was adopted by the ruling court. 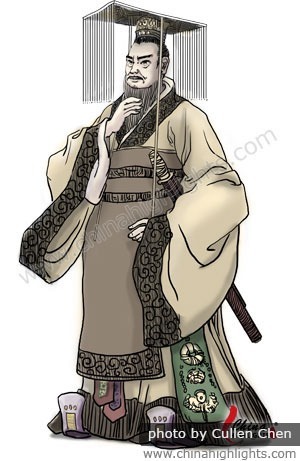 Shang Yang introduced a lot of major governmental and political reforms that were revolutionary for his time, and set the course for Qin to become militarily more powerful and more ruthless than the other states. There was a generally known protocol for warfare in the whole Zhou region until Yang came to power that was somewhat similar to European ideas of chivalry in combat. There were ideas such as generals should allow the opposing generals to set up battle formations before beginning battle and other ideas like that. There were also generally accepted family ties and responsibilities such as those espoused by Confucians. Shang Yang did away with the protocols and morals. He wanted subservience to the ruling court to be the foremost law, and to destroy enemies ruthlessly. He also wanted everyone to be treated equally under a fixed set of laws. In a way, this legal system was fair because it was less arbitrary. He thought that everyone should be ruled by the same laws whether they were members of a ruling clan or a peasant. Under Legalism, political opposition was not tolerated. One of the strengths of Qin was the tight central control. To increase production, Yang privatized land, rewarded farmers who exceeded harvest quotas, enslaved farmers who failed to meet their quotas, and used slaves for his major construction projects to create better infrastructure. He wanted to improve the transportation system so that the armies could move more easily and to enhance internal trade. He also emphasized the creation of large armies for military offense and the production of the best armaments. The technology advanced so that iron tools and weapons became common in Qin. Instead of corps of dozens of chariots as were used previously, organized cavalry with masses of infantry became common. In the end, the Qin could muster armies of hundreds of thousands. The new philosophy, weaponry, and construction projects made the large Qin armies ready for conquests. In the year 269, a general of Zhao defeated two Qin armies. After this, Fan Sui became the chief adviser to the Qin ruler. He instituted Legalism-type policies and advocated attacking the other states and killing off their people. They started preparing for major conquests. Qin rulers had an advantage in that their territory was in the far west of the Warring States region sheltered behind mountains with passes that could be defended. Sheltered in their territory, for a about a generation they focused on building up their army and settling the land to provide food for their expeditions and to create wealth. They forced the people to build the Wei River Canal, Dujiangyan, roads and other projects and to be soldiers. King Zheng (260–210) started to rule in 246 BC when he was 13. During a short period of time, his ruling court mobilized Qin for conquests and then started invading the other states. Several of the states surrendered instead of fighting. In 230, Han surrendered to Qin. They defeated Wei in 225. In 223, they succeeded in conquering Chu after a major defeat. Chu also had a large army and a lot of territory, but they were surprised by a sudden attack. In 222 BC, Qin conquered Yan and Zhao. In 221 BC, Qin conquered the last state called Qi. In this way, in only 9 years the Qin court gained the empire. King Zheng named himself Qin Shi Huang. His name means he was the first emperor and god of the Qin Empire. The centralization of power and the standardization of the different peoples they conquered was their priority. The Legalism philosophy of Qin Shihuang justified strict rule to increase the empire&apos;s strength and the dominance of the emperor and his top rulers. They wanted to standardize even the people&apos;s thought, believing that standardization and the squelching of any dissent against the rule of the court would promote their power. One of the first decrees of the Qin Empire was that all weapons had to be surrendered to them. They ordered that everyone had to serve for a year in the army. He ordered the destruction of the defensive walls of the former states, and the construction of the first great inclusive wall across the north. 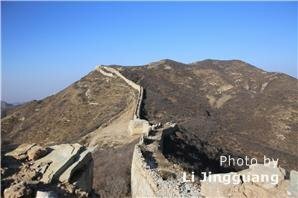 Meng Tian surveyed the geography, and oversaw the construction of a Great Wall and forts along the border. 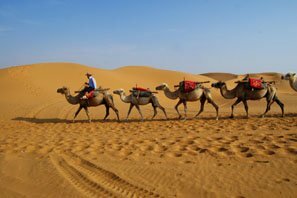 In 214, to secure his northern frontier, he appointed Meng Tian to lead an army of about 100,000 to drive away the nomadic Xiongnu. As part of the defensive strategy against them, Meng Tian surveyed the geography, and oversaw the construction of a Great Wall and forts along the border. The defensive works were said to extend over 10,000 li or more than 5,000 kilometers. In this way, northern areas were added to the empire. There were assassination attempts on his life. By killing many scholars and officials and imposing his harsh rule, many people hated him. He wanted to live forever, and he may have ingested poisonous substances given him by Daoists to try to gain immortality. He also ordered construction of the Qin Mausoleum where he could rule in case he died. 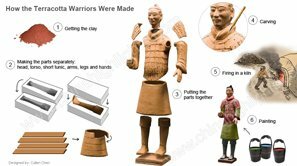 He had the great army of Terracotta Warriors built to guard him. He died in 210, and Li Si and Zhao Gao hid the news of his death. They had his son named Huhai who they thought was pliable installed as the second emperor. He was called Qin Er Shi. In their drive for power, Zhao Gao killed Li Si. Qin Er Shi killed off his family members and numerous officials in his attempt to strengthen his rule. He ordered foolish construction projects and policies and forced the people to obey him. Zhao Gao forced Qin Er Shi to commit suicide. Qin Er Shi&apos;s nephew named Ziying became the third emperor. By this time, there were revolts all over the empire, and many local officials were declaring themselves to be kings of their areas. He tried to maintain his power and survive by recognizing their rule while he tried to retain his position in the territory he still controlled. Bigger revolts against him started, and the new kings started battling. Rebels from Chu rebels under Liu Bang attacked. Liu Bang defeated Ziying, and he was executed in 207. In 206, the Qin capital city was destroyed. This was the end of the Qin Empire. Liu Bang defeated his main rivals in war to become emperor of a new empire called the Han Dynasty. The Qin Dynasty clan lasted for only 15 years and ended in suicide and death. But during their short reign, they destroyed more than half of the population and much of the culture, literature and scholarship of the Zhou era. It is thought that the population dropped from about 40 million around the beginning of their reign to about 18 million around the end of their reign. In carrying out their plans, they caused enormous misery and destruction, but they built up a lot of infrastructure such as roads, canals, and the Great Wall that benefited later empires. They standardized written language that was promulgated by Li Si became the common literary language for the whole region afterward until modern times. By standardizing even the writing and the ideas and customs and religion, they laid the foundation for later empires. Legalism became prominent, but Moism and probably dozens of other philosophies and schools of thought were destroyed along with their scholars and philosophers. It was thought that Moism was a popular philosophical school of the Warring States, but they were particularly attacked. An early form of Buddhism was destroyed. Out of this time of destruction and the laying of an empire, only Confucianism, Legalism and Daoism emerged as the region&apos;s main religions and philosophies. The Confucianism that was adopted in the Han era was one somewhat mixed with Legalism. Scholars taught that a strong emperor was necessary. Mencius&apos; philosophy became the standard Confucianism of the rulers of the Han Empire. To see Qin sites and learn more about this dynasty of 2,200 years ago first hand, the best place to go is the museum of the Terracotta Warriors and other sites in Xi&apos;an. Most Qin Empire sites are around Xi&apos;an. Tour ancient sites and Qin projects with our Xi&apos;an tours.